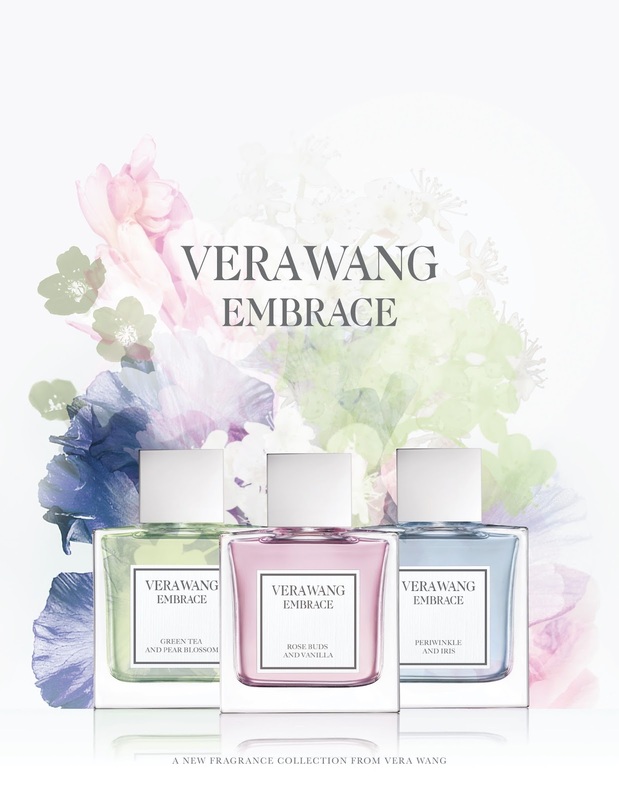 Lip Gloss Gossip: Vera Wang Embrace Fragrance Review and Enter to Win your own set! 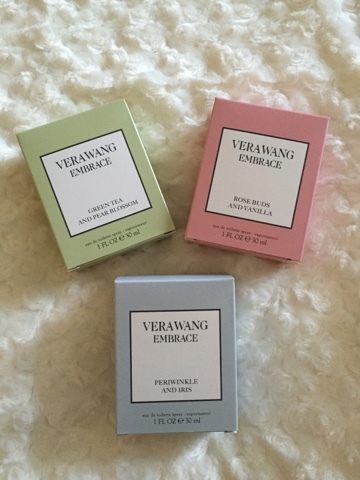 Vera Wang Embrace Fragrance Review and Enter to Win your own set! Here's something fun for a change! 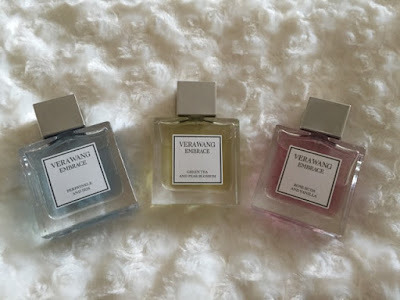 A fragrance review! I don't review fragrance too often but I do love collecting perfume and trying new scents. I do have a few signature scents that I stick to but it's nice to change it up every now and then. I received these last week and wore them all weekend long. 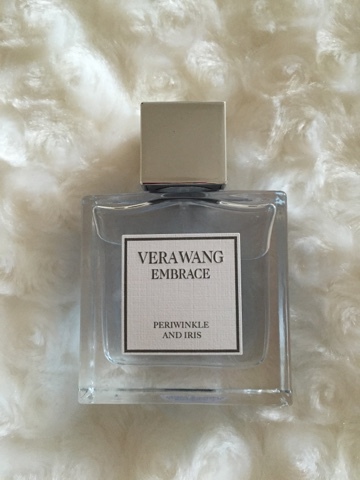 First up I used the Vera Wang Periwinkle and Iris scent. This one was my least favorite. I don't love how it starts out when first applied but after it settles it has light sweet scent. It lasted around four hours or so. By the end of the day I couldn't smell it at all. Not sure why. Can be purchased here . This was my favorite of the three. It definitely has a more of a muskier scent than the others but I think the green tea balances it out nicely. Of the three this one is more of an evening fragrance. It's a bit richer and more of date night kind of fragrance, yet its fresh and not over powering. This one lasted the longest. I could still smell it on my skin at the end of the day. I honestly can't get enough of this one! I can definitely see myself purchasing this when I run out. I honestly didn't think I was going to like this one as I'm not a big fan of rose scented perfumes but I actually really like it. It's my second favorite of the three. You can definitely smell rose but with the vanilla and musk it calms the rose scent down. It's not too prevalent after an hour. I smell more of the vanilla and musk after it settles on me. This one was about as long lasting as the Green Tea and Pear Blossom. I can see myself wearing this one is the Spring a lot. 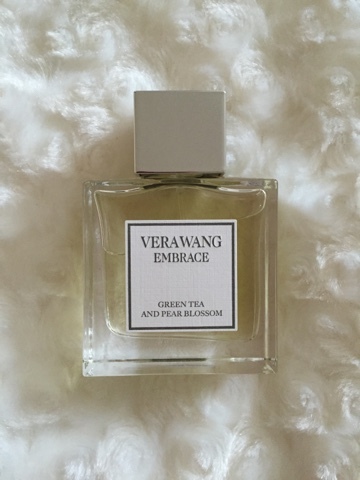 If you love floral scents that aren't too strong check this one out. The packaging on all three is simple yet beautiful. They all come in a square glass bottle with a white linen label. They each have one ounce of fragrance, which I think is great. I don't like to keep too much fragrance on the shelf. Overall I've really been enjoying the Vera Wang Embrace fragrances. I would definitely recommend the Green Tea and Pear Blossom and Rose Buds and Vanilla but of course fragrance is your personal preference. Now onto the fun part!! One of my lucky readers will win all three fragrances! U.S. only. Sorry to my International folks but I'll have other items for you to win very soon and it will be open to everyone, but for this one it's U.S. only. All you have to do is be a follower of my blog. If you can't follow me here for whatever reason, you can follow me on Instagram at lipglossgossip. To enter leave me a comment on this post telling me which fragrance you would love to try or why you would love to win! That's it!! Please include your email in your comment so I can contact you in case you are the chosen winner! Your comment counts as your entry. Giveaway will end October 8 at midnight PST. Winner will be contacted and I will need your mailing info asap so I can send it over to PR so they can get your prize mailed off to you. Fragrance provided by PR. Giveaway hosted by PR. I would love to win,because one,I'm all out of perfume and two,Rose and Vanilla scents are my two favorites! The top one sounds nice but its too bad the scent didn't last all day. I would love to try out the Rose Buds and Vanilla!